...don't deny yourself the pleasure any longer. Go ahead, live dangerously, try something different. 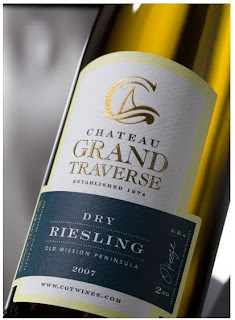 For the background on Chateau Grand Traverse, check out the SOF review. Though definitely a different wine, the 2008 Dry Riesling is pretty much a do-over in many respects. It's good, damned easy to drink, and a crowd pleaser. Not to mention a real shocker when people find out it's from Michigan. With aromatics that make you swoon, the nose on this wine screams spring. Fresh fruit flavors are kept from getting gushy by dry, balanced acids. This was poured in mixed company - blind - and, once again, to unsolicited ravings. Do we like it enough to get again? Oh, yeah. Should you? Absolutely. Good call you guys, CGT is making some stunning Rieslings. Michigan, and northwestern Michigan in particular is a place folks should be taking notice of. I am glad that you are recognizing some of the great wines made in Michigan. Next, be sure to explore some Cab Franc and Pinot Noir.